Toril Simon, a volunteer with Victory Gallop, guides Willie out of the trailer to make his debut. 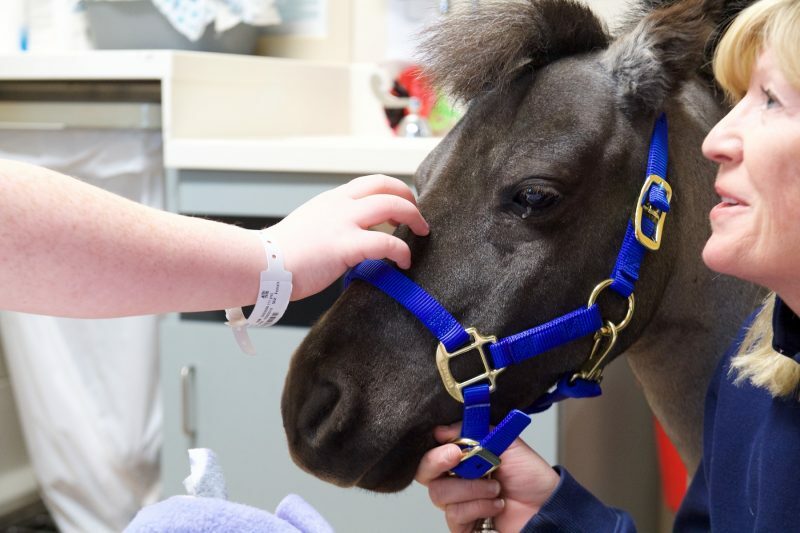 Willie the pony made many lasting memories during his first official visit to Akron Children’s Hospital, greeting patients bedside on Tuesday. 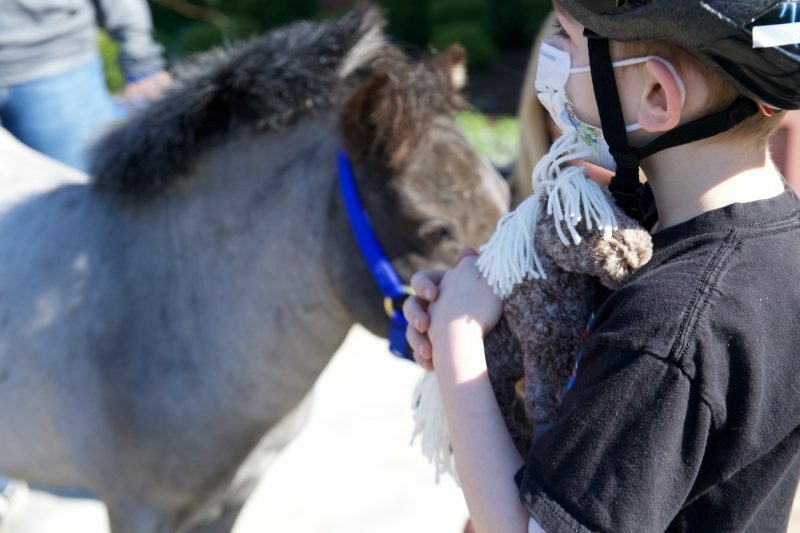 Willie Nelson, a therapy pony handled by Victory Gallop in Bath Township, gets around town. Since his arrival to Bath Township in October, he’s been spotted shopping at several local pet stores. And you may have seen him visiting with residents in area nursing homes. Sue Miller and Kim Gustely, co-directors of Victory Gallop, have been busy socializing this well-behaved pony since he arrived at the farm. He hangs out in Miller’s home while she works in her office, and he’s fond of the many children who volunteer and participate in Victory Gallop’s therapeutic riding programs at the farm. Willie meets his first friend at the hospital. The delighted patients were glad to have his head height right where they could pat his nose without having to get out of bed to enjoy the visit. Willie made about a dozen bedside visits to hospitalized patients, handing out a “mini me” stuffed animal version of himself to all. It was clear his presence in the unit delighted everyone, staff included. Nolan Wickland, 7, of Akron, had quite a surprise in the park as he rode a bike for physical therapy. Willie walked over to meet him and left behind a keepsake that Nolan immediately started to cuddle. Wendy Sawyer, volunteer recruiter, made a special effort to get out to see Willie on Tuesday. 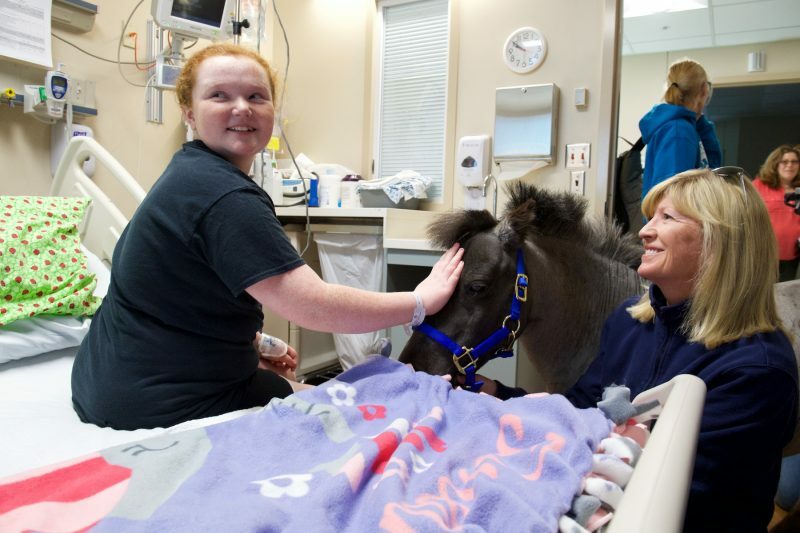 She’s a big fan of Willie’s predecessor, Petie the Pony, who visited hospitalized children at Akron Children’s for the past 20 years, right up to his death in September. For patient Kara Haynes, Willie’s visit gave her a reason to smile, something her mother, Susan, said Kara hadn’t done much of since her admission to the hospital last week. Kara Haynes, 11, of Massillon, was the perfect first patient to pet Willie bedside — she LOVES animals! Miller said it is of the highest importance to Victory Gallop to continue to provide this experience to kids when they need a smile the most. She was very pleased with his debut performance.